Tagged Galactic Laser, Laser Battle, laser tag, Laser Warzone. IT’S been almost 10 years since How I Met Your Mother first started preaching to everyone about how awesome laser tag is. On the hit sitcom, the game is portrayed as the coolest, most fun thing you can do – so long as you can ignore the fact that everyone else thinks it’s for kids. So, over the past week, we at R.AGE accepted the challenge. Putting aside us being (supposed to be, more like it) professional journalists, we signed ourselves up for a few rounds of laser tag. And surprisingly, we found that there are quite a few places in Malaysia for it. Not so surprisingly, most of our opponents were kids. The basic set-up at all the places was pretty much the same – you suit up with an LED-lit vest that comes with an attached laser “gun” and you get sent into an arena where you attempt to “shoot” (they prefer to call it “tag”) other players for points. It’s like paintball without the paint. Or the pain. In the dark: Most laser tag games are played in the dark settings where visibility is almost zero. True enough, we all found it to be totally and utterly awesome – and a pretty good work-out, too. 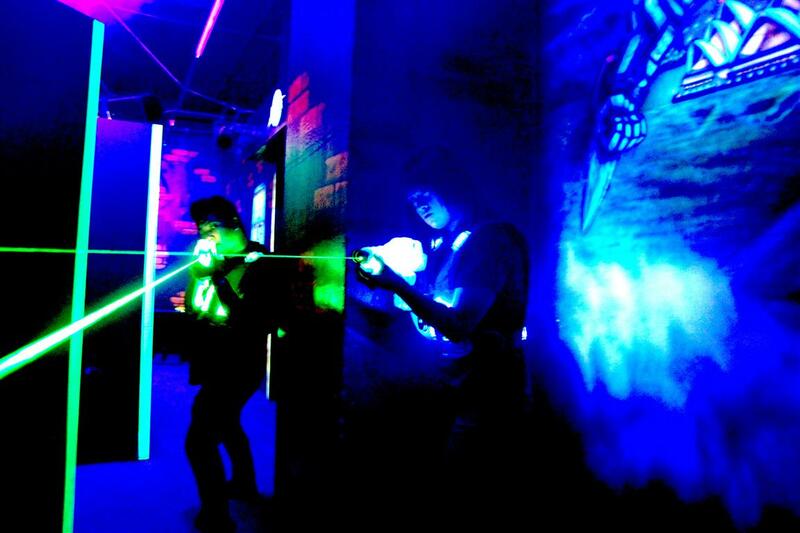 Each round of laser tag usually lasts about 10 minutes, but don’t be fooled. By three rounds, most people would’ve already had enough adrenaline-pumping action for the whole week – so it’s both fun and good for you! There are also different game modes you can play. You can play in teams, or, if you’re a fan of total chaos, the free-for-all format, where it’s every man or woman for him or herself. The basic objective in most game modes would be to accumulate the highest number of points for your team or yourself. You tag someone, you get a point. But there are also other game formats that mix things up, like with the classic “capture the flag” scenario, where the ultimate objective involves breaking into your opponents’ base. But whatever the game mode, scenario or format, it doesn’t change from you wearing multi-coloured LED vests and firing laser guns at each other. In what universe is that not fun? If you want to try it out for yourself, here are a few places we checked out recently. They have two outlets in Selangor – one in IOI Mall, Puchong, and another in e@Curve, Mutiara Damansara. The battlefield-inspired arenas are pretty awesome. Each round lasts 10 minutes at RM20 per person, and RM17 for students. For more info, check out laserwarzone.com. The Galactic Laser outlet in Mid Valley Megamall, Kuala Lumpur has to be one of the best around. It has a two-floor arena that can fit up to 33 players in a single round. Their other outlet is located in Sunway Pyramid, Petaling Jaya, Selangor. Players can choose from a huge range of game types, including special missions like “Space Marines”, where players take on various roles like medic, ammo carrier and commander. A single round costs non-members RM25 on weekends and public holidays, and RM20 on weekdays. Find out more at galacticlaser.com. This laser tag operator currently has a branch in Ipoh Parade, Perak and will be branching out to Johor Baru and KL later in the year. One of its most interesting special missions is “Midnight Madness”, which is played in complete darkness. All you have is the glow of your laser guns to guide you, and there’s even a smoke machine to further highlight the lasers. Two sessions cost RM20 on Monday to Thursday and RM25 on Friday to Sunday. For more information, head to www.indoorlasertag.com.my.